HIGHTECHHOLIC: Asus and Acer presented new Windows 8 devices..
Tablet 600 - Windows RT Tablet on Nvidia's Tegra 3, with 10,1 inch Super IPS + screen, with resolution of 1366 x 768, with 2GB of RAM and camera resolution 8-megapixel. Tablet 810 - The Intel Atom chip, 11,1 inch screen, and the fully installed Windows 8 are the only difference from the Tablet 600. 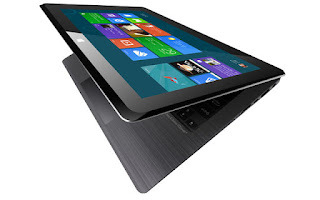 Taichi Hybrid, lap top and tablet in one. - Has two screens and a keyboard. It is a device that works on the i7 processor, with 4GB of RAM, two USB 3.0 ports and support for NFC, and is available in a size of 11.6 and 13.3 inches. It is speculated that this device will work on Windows 8 and Android, the teaser also confirms this. On the other end, Acer also presented various Windows 8 devices: Iconia W510, 10.1-inch tablet and Iconia W700, tablet with 11.6-inch screen in Full HD. The precise specifications are not known, but it is known that the devices work on Intel processors, and that the price of the smaller models range from $599-799 and the bigger from $799-999. Besides tablets, Acer has unveiled two new Aspire S7 ultrabook computers, 11.6 and 13.3-inch model.